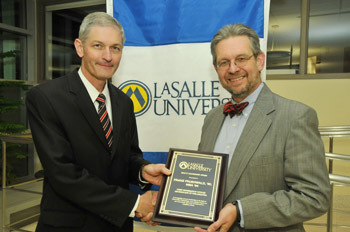 Franz Fruehwald, right, accepts La Salle University’s 10th annual IT Leadership Award Nov. 10. La Salle University honored Franz Fruehwald, chief information officer for the Archdiocese of Philadelphia and a La Salle alumnus, with its 10th annual IT Leadership Award at a ceremony Nov. 10. Award recipients are selected for having a positive impact on business, government, education and/or society through the advancement of information technology; making a significant contribution to the community through proven information technology leadership in business, education, government, or civic affairs; and serving as an outstanding example to all students pursuing their goals in the field of information technology. Fruehwald joined the Archdiocese 25 years ago, starting in the finance office of Catholic Social Services (CSS). Later he became the assistant executive director for the development programs division of CSS, where he oversaw a department of 500 employees and managed a $45 million budget. Fruehwald did not plan on a career in computing. He graduated from La Salle in 1980 with a B.S. in accounting and earned an M.B.A. with a concentration in finance from La Salle in 1994.